Home » Blogs » Building Relationship Skills » Old Guys Rule! Linda: You see them in the park pushing the grandkids on the swings, wearing infants in their front packs, with toddlers in backpacks, pushing strollers, and holding small hands walking the kids to school in the morning. These older gentlemen are reaping the rewards of the work done by the torch-bearing women of the 60’s and 70’s, and 80’s who struggled to blur gender roles. Since these pioneering women entered the work force in legion numbers bringing income into their families, putting food on the table, and keeping the utility bills paid, many of their men have stepped up to the plate to take on some of the responsibilities that they were no longer able to carry. These couples became experienced negotiators as they worked out arrangements that broke new ground for gender roles in nuclear and extended families. It was a piece of work to change and expand the roles and rules of society. And as stereotypical beliefs gave way to the new normal, fathers began to reap the benefits of having closer bonds with their children and the deep appreciation of their wives for sharing the tasks required to enable a family system to run smoothly. Many of these transformed men no longer need coaxing from their wives to get involved with the kids. They are self-motivated by the newly-discovered pleasure in connecting with their children and grandchildren. They have become experts in the art of diaper changing and they have stayed home from work with sick children. While the transition hasn’t been without its bumps and challenges, as tends to be the case with all social change, the process has been and continues to be beneficial for all parties. In August, the babysitter for my grandsons went on vacation giving very little notice to my son Jesse and his wife Cassia, who were sent scrambling to get coverage. So who do you think stepped up to offer coverage? The old guys. Poppa Charlie and Poppa Gino filled in, got the kids dressed, carted them to drama camp, the swimming pool, and birthday parties. Poppa Gino and Poppa Charlie jumped with both feet into what in prior years was only Grammy’s territory. They even baked cookies and brownies with the kids. Best of all, according to all the guys, young and old, they got to spend some real quality time together and had a lot of fun. Child psychiatrist Arthur Kornhaber, M.D. is the pioneer of the Grandparent Study, the longest ongoing study of the relationship between grandparents and their grandchildren. He claims that the ninety-five percent of all people over age 65 who have adult children who also have grandchildren, can be a source of support that can enrich the lives of everyone in the family. Kornhaber identifies 11 roles that grandparents play in the family: Ancestor, Buddy,Hero,Historian,Mentor, Nurturer,Role Model,Spiritual Guide,Student,Teacher, andWizard. Kornhaber claims that grandparents act as family historians who often inform current generations about their family lineage and traditions. Grandfathers have plenty of wisdom and life experience from which to draw. Those who report having close relationships with grandchildren describe the joy they experience as a result of the mutual love that they share. 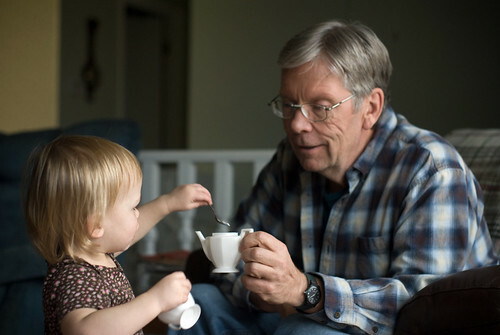 Because grandfathers are one step removed from direct disciplinary and parenting responsibilities, grandchildren tend to be more relaxed and more open to sharing themselves with them. Grandfathers can have a powerful influence on their grandchildren by teaching about perseverance, loyalty, hard work, patience, and sacrifice that they have learned from their life experiences. Grandfathers help their grandchildren form their identities by transmitting values, ideals, and beliefs to them. Through relationships with those of previous generations, children can gain a better grasp of who they are and where they came from. Involved grandfathers can transmit knowledge about cultural and familial roots and values pertaining to education, and ethics related to work, religion and morality. While the beliefs of the parental generation may not always be completely in sync with their parents’ generation, the benefit from grandparent involvement is generally far greater than difficulties that arise from it. Consistent grandparental involvement also creates an emotional relationship between them and their grandchildren which provides a sense of safety and protection. It has been shown that children have a higher level of self-confidence when grandparents are involved. This stability can significantly affect children’s academic, psychological, and social development. Frequent two-way communication between grandparents and their grandchildren is important for building a strong relationship. Keep in touch throughtelephone calls, virtual visits via Skype, photos, texting, emails, cards, drawings, or handmade items that show a child’s new skills. Grandparents and grandchildren alike have knowledge and skills that they can share with each other. The act of sharing binds the relationship and extends the knowledge and skill of both grandparents and grandchildren. Researcher Kirk Bloir, M.S., Extension Associate, Human Development & Family Science, The Ohio State University has found that grandchildren who have a close relationship with a grandfather are likely to perform well in school, display positive emotional adjustment, have higher self-esteem, and a greater ability to develop and maintain friendships. • Have a vested interest in the well being and healthy development of their grandchildren. As for me, as a grandmother, I find myself choking up not only when I see how close Charlie is with our own grandchildren, but also when I see the grandfathers I don’t even know playing with their grandchildren in the playground across the street from our home. I lived to see the day when what had previously been just a dream of mine came to fruition and has become a reality. And for this I am deeply grateful.